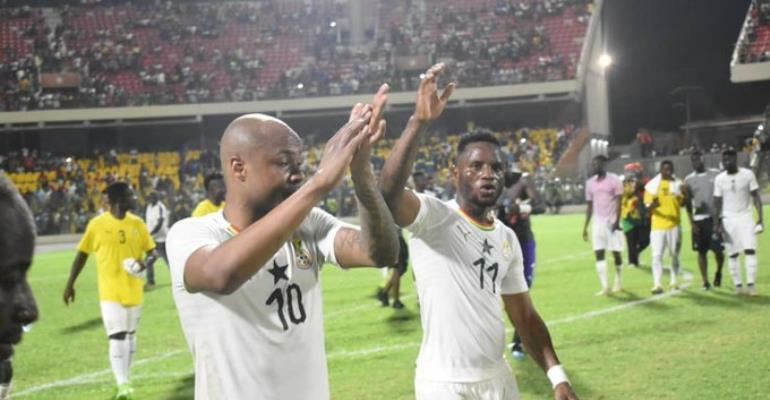 Andre Dede Ayew has heaped praises on fans who were at the Accra Sports Stadium on Saturday to show their support for the Black Stars against Kenya. The FIFA U-20 World Cup winner led Ghana to a 1-0 win over the Harambee Stars as Ghana finished the AFCON qualifiers as Group F leaders. The Accra Sports Stadium was almost full to capacity with fans singing and chanting the stars on to victory. The deputy Black Stars skipper who is poised for the Nations Cup in Egypt praised his teammates for the win and lauded the Black Stars fans for their massive support. The Black Stars qualified for their 22nd AFCON and are seeking for a fifth title since 1982. The four times champions will host Mauritania in a friendly on Tuesday as part of preparations for the tournament in June. Caleb Ekuban scored the only goal for the Black Stars.